At M.C. Schaff & Associates, Inc., Susan is responsible for Geographic Information System (GIS) development for City and County government clients; as well as utilizing various computer applications for the support of other divisions pertaining to field data collection, data conversions and design and development of graphical figures and presentations. Susan Is involved in the creation of extensive datasets and network models, for water, wastewater and stormwater utilities as well as transportation. 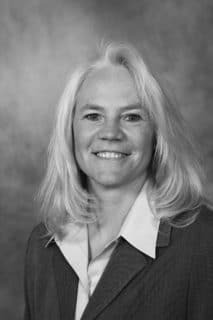 She was deeply involved in the Transportation Plan Update for the Cities of Scottsbluff and Gering involving the development of a transportation model with extensive demographic and transportation-related spatial datasets. During her career, Susan has been involved in creating geographic information systems for city and county government, performing city GIS data maintenance and development, automated road inventory, civil engineering drafting and design, and construction inspection. She has performed GIS dataset creation and maintenance, GPS field data collection, database development, and building and site design/drafting for municipal government.